Communicating what physics says — The Science Asylum – Physics says what? Today’s post is somewhat different than usual. I’m highlighting a YouTube channel. Communicating science to a general audience has a long history. The bibliography for my physics blog contains some books by authors to this purpose. Modern physics has many great stories, and the just plain strangeness of quantum physics lends itself to great storytelling. I’m particularly interested in efforts using visualization (which includes dramatization) to communicate what physics says. And then there are small teams or “lone rangers” with a passion for explaining what physics says, whether they have any formal title such as visualization scientist or science communicator. Desktop visualization tools permit them to include animation which used to require a CGI budget like that of a major film production. Which gets me to Nick Lucid’s The Science Asylum YouTube channel [also here]. At the Science Asylum, we present anything related to science from the point of view of Nick Lucid… a physicist already driven a little crazy by science. 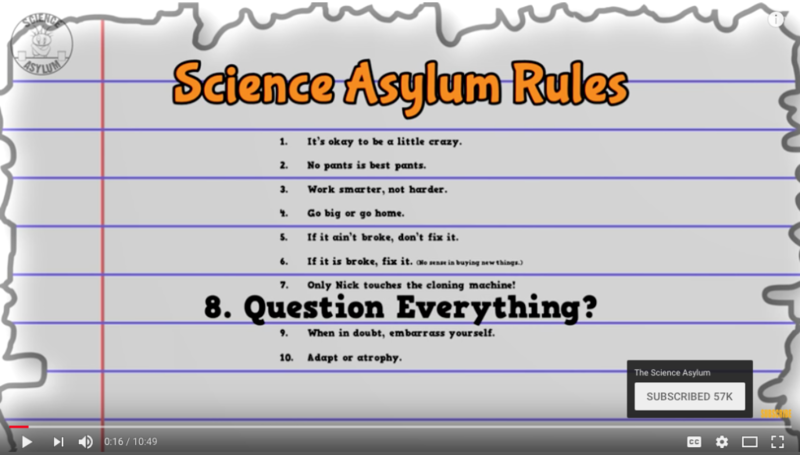 What is the Science Asylum? A educational channel run by a crazy scientist with the assistance of a bunch of his clones. Here’s a sample of the madness. The impetus for this post was three YouTube videos by The Science Asylum which I watched recently. These videos cover some favorite topics and questions for which visualization (especially in those books in my bibliography) remains quite limited. What is a Quantum Field?!? Published on Jan 3, 2018. You might hear a lot of physicists talk about how quantum fields govern the microscopic world of elementary particles like electrons, photons, and quarks. How exactly do they do that and what is this quantum field thing anyway? Why Doesn’t Light Have Mass? Mass? Energy? What’s The Difference?! Published on Jul 10, 2014. In 1905, Einstein came up with his famous equation showing a relationship between energy and mass… but what does it really mean? The answer might surprise you. I included Nick’s “What is Quantum Spin?” in my “Quantum spin — angular what?” post. I can quit my other jobs and do the Science Asylum full-time …which would be HUGE! Without those other distractions, the quality (and possibly quantity) of the videos would drastically increase. That’s just awesome for everyone. Regarding a photon’s mass/energy/inertia, you can’t “push” a photon, eh. Update [1-12-2018]: Here’s a screenshot of Nick’s Science Asylum Rules from his YouTube video “Is Math the Language of the Universe?” (published 12-31-2016).